2 cute braided hairstyles using one technique! You might remember the "scallop edge braid" and "stripe braid ponytail" hairstyles we posted awhile back? This "folded feather braid" is made using a similar technique. 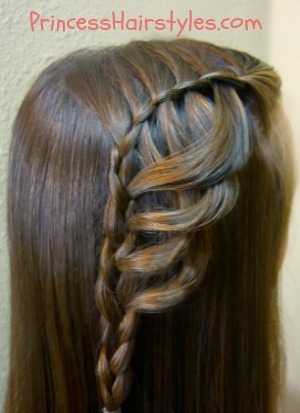 My friend Mindy over at CuteGirlsHairstyles has also done several cute styles using "feather braids" recently. All of these hairstyles are created by removing strands from the braid and adding them in at a later point. This particular styles uses a lace french braid. I think the end result is very lovely! In the photo below, we made some rope braids (or twist braids) with the feathered strands before we braided them back in. 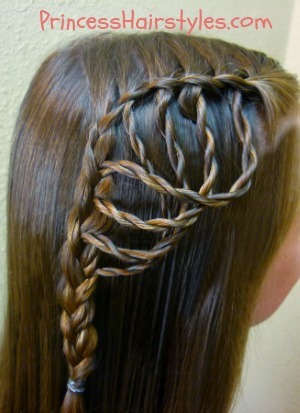 Of course, if you want to use standard braids, you could do that as well. This variation creates an adorable "braided braids" look! These 2 hair braiding hairstyles can be made using either waterfall braids or feather braids (either will work great.) Do whichever braid you prefer! I personally find "feather braids" to be a bit easier and quicker.